For loads, the program automatically assigns the names L-1, L-2, L-3, and so on. Load Class To specify the class of in terms of importance. You can select Essential, Critical, or Non-essential. This field does not affect analysis. It can be used in database query to distinguish a certain load class from others. See Advanced Query. Specified: Designates the Load Data field to a user-entered model. You can enter any combination of constant kVA, constant I, or constant Z load. 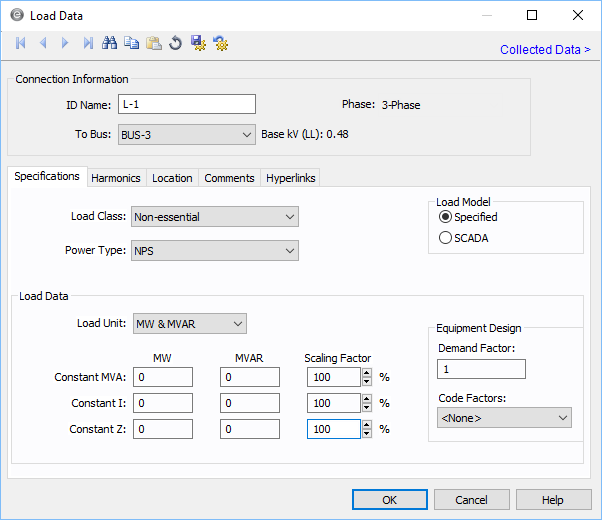 SCADA: Designates the Load Data field to an imported real-time SCADA model. Data can also be user input in the SCADA fields just like Specified data. NPS: Normal Power Supply. For example, a power supply that has no backup. CPS: Critical Power Supply. For example, a power supply that includes an uninterrupted power supply backup. EPS: Emergency Power Supply. For example, a power supply that uses a generator for backup. Any combination of constant kVA, constant current, or constant impedance loads may be modeled. Different types of loads can also be mixed and matched to model a specific type of equipment such as variable speed drives. Load Unit Specifies the units that will be used for load data. Use the box to choose the unit. Constant kVA/MVA Constant kVA load entered in MW and MVAR. Note that the term “constant kVA” seems to be an industry standard even though MVA seems to be the more common unit for large industrial uses. See also Notes on Power Factor. Constant I Constant current load given in MW and MVAR. These values should be entered in per-unit. Constant Z Constant impedance load given in MW and MVAR. These values should be entered in per-unit. Scaling Factor Each load can be varied by applying a different scaling factor. This lets you model the actual panel or lumped load on a bus, then study different loading conditions. This allows quick “what if” studies and prevents errors that occur from data entry. Demand Factor Demand factor for the load. Code Factors NEC code factor for the load. Load Class To specify the class of in terms of importance. You can select Essential, Critical, or Non-essential. This field does not affect analysis. It can be used in database query to distinguish a certain load class from others. 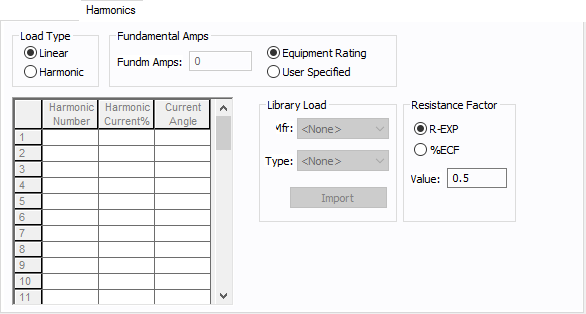 Load Value Rated load in kW or Amps. 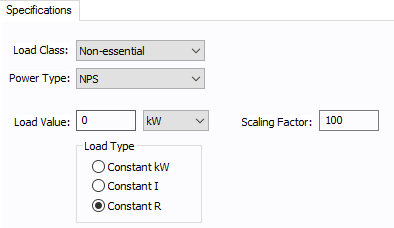 Scaling Factor Ratio of actual load to rated load in percent. This is used in power flow calculations. Constant kW: The kW consumed remains constant even when terminal voltage changes. Constant I: Constant current is drawn by the load even when terminal voltage changes. Constant R: The resistance is constant, so the kW and current will vary based on the terminal voltage.